Catch more fish with clean hands! Also removes smells of insect repellent, sunscreen, food, etc. If you use sunscreen or insect repellent, eat while fishing, operate a motor, or smell like a human which you do, fish will smell you. 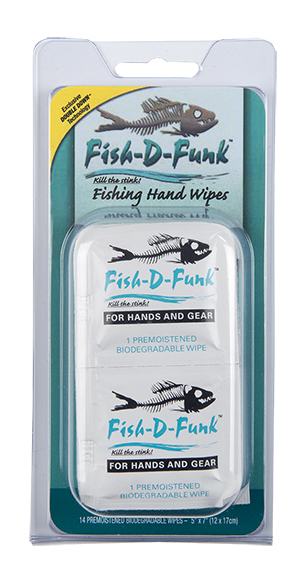 Fish-D-Funk Fish Catching Wipes remove/neutralize these odors, so they, enhance your chances of catching more fish! Fish reportedly can smell one part per million in water. That means they can smell you on your bait or lure. Remove/Neutralize this human scent with Fish-D-Funk Wipes! Sunscreen, insect repellent, sandwiches, flavored chips, soft drinks, beer, hand sanitizer, gasoline. None of these smells help you catch fish. Getting rid of them with Fish-D-Funk will! Fish-D-Funk has been tested on some of the most fragile bait fish. Fish-D-Funk will not kill or harm the bait!